Despite the recent economic slowdown across Asia the potential for future growth in consumer spending offers opportunity when it comes to commercial real estate, especially for sectors such as industrial and retail. The rise of the consumer class in Asia has come in part thanks to rapid growth rates in gross domestic product (GDP). China is expecting 7.8 percent growth this year and next, according to Jones Lang LaSalle. Excluding Japan, Asia is projected for 6.3 percent this year and 6.6 percent in 2014. On the one hand, those are numbers that have fallen short of expectations. All eyes are on China, which is undergoing an industrial restructuring. The country is closing over-producing factories to stamp out price wars. There are also worries of a real estate bubble. To stimulate its economy, the country has also built cities that remain virtually vacant. Yet longer term, the strong consumer-spending growth in Asia is good news for suppliers of industrial and retail space to meet the rapidly growing middle classes, especially in first- and second-tier cities where macroeconomic forces translate to building opportunities. “Those fast-growing GDPs are creating an enormous demand for lots of new and better supply,” says Robert Taubman, chief executive officer of retail REIT Taubman Centers Inc. (NYSE: TCO). All the growth has meant robust returns over time. Measured in U.S. dollars, Asian REITs delivered a total annualized return of 23 percent for the 12 months ended June 30, according to a basket of developed countries in Asia under the FTSE EPRA/NAREIT Developed Real Estate Index. That compares with roughly 14 percent for all REITs worldwide and 8 percent for North American REITs. Buyer beware, of course, since in the short term Asian markets can be volatile. Commercial real estate total returns for China for the first six months of the year were negative 10 percent, according to the FTSE EPRA/NAREIT indices. Singapore lost 10 percent, and India dropped a whopping 34 percent. But the upswings have more than made up for steps back. For the 12 months ended June 30, China was up 17 percent, Indonesia was up 46 percent, Japan was up 42 percent and Thailand was up 51 percent, according to FTSE EPRA/NAREIT data. Compared with other ways to invest, Asian REITs are gaining traction. Initial public offerings and other equity capital raisings are on the drawing board. Commercial real estate in Asia has also delivered over the long term. Since the inception of the FTSE EPRA/NAREIT Asia Pacific Index, the annualized return mid-year for Asian REITs was 7.8 percent, versus 5.5 percent for the MSCI Asia Pacific Index. The long-term picture tends to excite the real estate world, despite short-term hiccups. While annualized growth rates for Asian economies have been recently disappointing to some observers—due to an economic slowdown in the region—the rates aren’t bad relative to industrialized markets, notes Megan Walters, head of research for the Asia Pacific capital markets with Jones Lang LaSalle in Singapore. She compares the GDPs of Asia with the meager projections for Europe this year. Industrial properties have been one key beneficiary of increasing consumer demand in Asia, especially in China. What makes China so compelling for commercial real estate developers is not just its growth rate, but how it’s in the early stage of transition from an export economy to a consumer one. That means there will be a great need for investment in retail and industrial supply in the coming years. China’s middle class, whose size now rivals the entire population of the United States, is projected 10 years from now to be in the range of 700 million to 800 million people. The country had retail sales growth of more that 14 percent in 2012 and is predicted to almost match that figure this year, according to research by Singapore-based industrial developer Global Logistic Properties Ltd. (SGX: MCO.SI). Moreover, more than 10 million people migrate to urban areas annually, according to Global Logistic (GLP). About 50 percent of the population was living in urban areas by 2011; that figure is expected to reach 70 percent by 2013. Seems like that strategy is working for GLP. It has become a major logistics player in China, with 61 million square feet of space as of March 31. The nearest competitor, China-based Blogis, had 9.7 million square feet. GLP had development starts representing about 29 million square feet for the fiscal year ended March 31, up 62 percent from the previous year. Yet, GLP’s estimated demand for space was about 75 million square feet as of mid-year. “We can only build as fast as the scale of our organization,” Schwartz says. With GDP growth at 7.5 percent and retail sales growth around 14 percent, the country will inevitably shift towards greater consumption. Domestic consumption is about 30 percent of GDP, compared with 70 percent in the United States, Schwartz notes. So, even assuming China wouldn’t quite equal America’s consumption rate, there’s plenty of room for growth. More time is needed, according to Ichiro Makijima, executive managing director of the Association for Real Estate Securitization (ARES). He says that within a few years, the total market capitalization of J-REITs could reach $100 billion, up from roughly $63 billion today. There were six IPOs worth $4.9 billion and 23 public offerings worth $5 billion in Japan from October 2012 to July of this year, he notes. “Abenomics has brought about upgrades in stock prices, but it will take some more time until the policy is reflected in the real economy and property prices,” Makijima says. Listed Japanese real estate companies had gained 42 percent for the 12 months ended June 30, according to data from the FTSE EPRA/NAREIT Developed Real Estate Index. Given the run-up in the Nikkei stocks of late, logistics companies have tapped the equity markets. Investors are hungry for a piece of industrial space. GLP J-REIT, set up by Global Logistic Properties, raised $1.3 billion in Tokyo last December. Prologis Inc. (NYSE: PLD) raised $1 billion in February, forming Nippon Prologis REIT Inc. (TSE: 3283) for logistics facilities. The J-REIT purchased 12 properties from the Prologis platform to start out. Japan is also undergoing structural demand changes for commercial real estate. In the industrial sector, there is a big need for Class-A logistics space, which tends to be distribution centers with a horizontal footprint—one or two stories— to maximize efficiency. These facilities also have enormous floor areas, high ceilings, high load tolerances, wide column spacing and elevated berths. Multiple-story structures have wide spiral ramps for trucks. Japan, which has a large stock of older warehouses of three to five stories with only freight elevators, has a shortage of space that conforms to the growing needs of Internet retailing. Giants such as Amazon and Japan’s top online retailer Rakuten demand space that will allow for same-day delivery in major cities: distribution near population centers with efficient layouts. It is this need for reconfiguring logistics space for e-commerce that is driving returns for industrial space, Anderson says. For its part, Prologis had 55 high-quality properties in Japan at the end of 2012. Japan also represented 25 percent of its projected development of $2.5 billion, according to a mid-year presentation from the firm. The new paradigm is speed and efficiency for tenants. Inquiries for distribution space at Global Logistics, for example, have increased 50 percent in terms of square footage since Abe’s election last December. Before the election, inquiries for space represented about 600,000 square feet per week, according to Schwartz. Since then they’ve averaged 920,000 square feet per week. Properties in development are leasing up fast due to placement in low-vacancy areas for Class-A space: A third phase of a property in the Tokyo area was 65-percent preleased in May right before its completion. “We are really seeing an increase in demand in the regional centers in addition to continued strong demand in Tokyo and Osaka,” Schwartz says. With retail, consumer demand in Asia presents similar opportunity. Taubman likens the market in China to the market for malls in the United States in the 1960s and 1970s. Taubman Centers executives came to the conclusion about a decade ago that there would be fewer opportunities in the United States for new supply. The company had the balance sheet to consider incremental growth above what it would find at home. Now, Taubman Centers is currently building a 975,000-square-foot mall due to open in 2015 in Xi’an, a tier-two city with 8 million residents in western China, and a 1.5 million-square foot mall in Zhengzou, an economic hub in the central part of the country that is scheduled to open the same year. Both properties are joint ventures with Beijing Wangfujing Department Store, a major retailer that has a controlling interest. In South Korea, Taubman Centers is developing Hanam Union Square, a shopping mall anchored by Shinsegue Department Store, in the city of Hanam. The city is part of the metropolitan area of Seoul and taps into its population of 24 million. “We settled on Asia about eight years ago as the place we would see if we could make a go of it, and all the fruits of that work over long periods of time are now starting to evidence themselves,” Taubman says. Meanwhile, Simon Property Group Inc. (NYSE: SPG) has exported its popular Premium Outlet concept overseas, because the tenants make up well-known brands that are appealing to middle-class Asian consumers. Simon now has 11 Premium Outlets in Asia, with eight in Japan, two in South Korea and one in Malaysia. 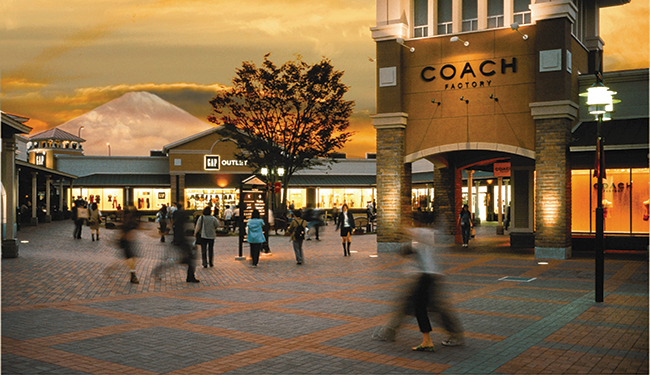 It opened Shisui Premium Outlets in Chiba, Japan—a 230,000 square foot property—in April and Busan Premium Outlets in Busan, Korea—a 340,000 square foot site—in September. What makes Simon’s model work overseas is, in part, its existing relationships that it can leverage with global retailers, says Stephen Sterrett, senior executive vice president and chief financial officer. More than half the stores are global brands found in other Simon outlet malls. “Having the tenants be comfortable that we can take them to various and sundry parts around the globe and have them be successful is very important,” he says. Yet, key to success is finding local partners. Simon has joint ventures with various stakeholders. In Japan it collaborates with developer Mitsubishi Estate Co. In South Korea, Simon works with Shinsegae International Co., an apparel, cosmetic and retail company. It has partnered in Malaysia with the Genting Group, a holding company for companies in hospitality, leisure and agriculture. For U.S. REITs, resources and prudence help, too. Choose countries and continents wisely, executives say. Taubman Centers, which had a market capitalization in July of roughly $5 billion, has concentrated on Asia for its overseas exposure. With more consumers joining the middle classes in Asia and strong GDP growth rates in the years to come, the long-term focus overseas for Taubman and other players in the retail and industrial sectors has a good chance to pay off.